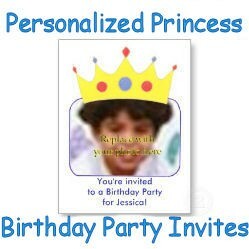 Easily add a photo of your princess to personalize these cute birthday party invitations. Kids like to play dress up and pretend, and there are easy ways to do this for some inexpensive party fun. Give girly party favors out ahead of time that include little gift bags of costume jewelry, hair clips, scented lip gloss, and more, for some easy party fun. Below are more tips for having a princess themed birthday party. Does your daughter like playing dress up? Mine loved it. She was many things; a princess, a mermaid, a cat, and more. What is your daughter's favorite thing to wear when she pretends to be a princess? Does she wear jewelry and beads, veils, flowy dress, etc.? As a kid, I liked dressing up as Endora from Bewitched. I loved dressing up in draped things. As long as it was kind of long and flowy, I was Endora. There weren't any costume stores near by, so we were very creative in creating our own. What do you have around the house that might work as a pretty cape? Inexpensive material that comes in a variety of colors, and doesn't ravel, would be crinoline and fleece. Send out the invitations approximately two weeks before the party. That way guests will have some time to make plans to be there. 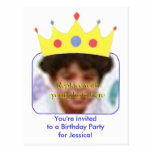 You can crown your princess with a crown, with the invitations below. You can do a fun photo shoot with your daughter, with a camera phone. Then send the photo to your email address.On my phone, I usually pick the medium size. Once the picture is received in your email, save it to a picture file. You'll then be able to crop it if necessary, re-size it, etc. Then click on any of the princess items below. You'll be able to change the text on the template form. Under the photo placeholder, click on Change. Then find the photo you stored on your computer and open it. It will then automatically upload. If you need to adjust the size, click on Customize It. You'll then be able to click on the photo to move it, and on the corners to shrink or enlarge the size. If the photo looks pix-elated, you will need to re-size your photo in your picture program to a larger size, and then change it out. Be sure to customize all the text and make sure it's correct before placing your order. You can choose from two sided invitations and postcards. 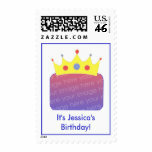 You can also personalize your invitations with matching postage stamps. Costume Jewelry can be a string of beads. Beaded necklaces can come in a variety of colors. You can buy them pre-made, or have a fun activity with your daughter, making them ahead of time, and having an outing out to the craft store. Beads come in a variety of shapes and sizes, and some also come in large kits. If the kids are on the older side, they can even enjoy stringing their own jewelry at the party. Jewelry and Bead kits can also be purchased online. You can supply necklaces in a goody bag or the kids can make their own. Fashion functionality for Valentine's Day or Mardi Gras, or any time you want to wear your heart around your neck. Use for dress-up, party favors and more. May your princess have a fun birthday party. Your questions and comments are both welcome. Do your kids like to color? Do they want to move beyond coloring books? Placemats with outline drawings on them can be the perfect solution. Pointillism can be created with media other than paint. Come find out about a unique and fun way to create a pointillism frog using foam stickers.